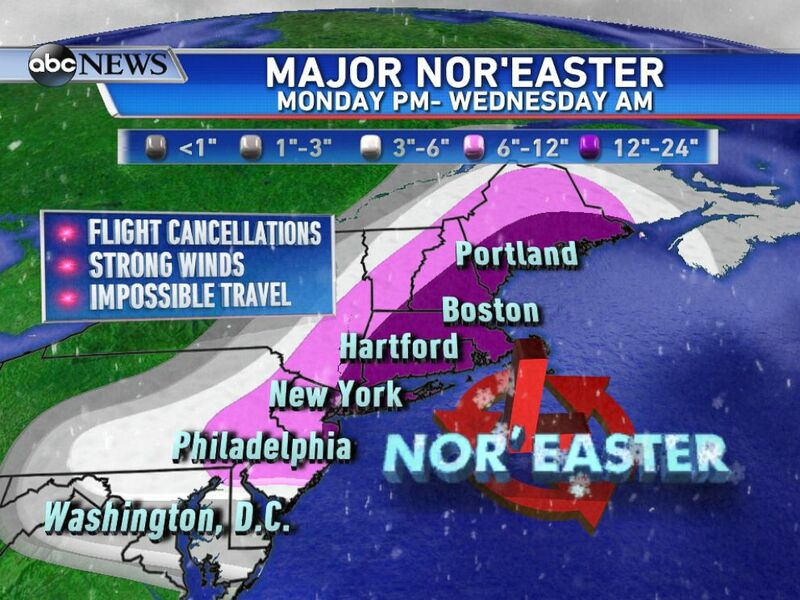 Airlines have already cancelled 1,422 flights for Monday as a major blizzard is predicted to hit the Northeast, bringing as much as two feet or more of snow from New Jersey to Maine. Another 1,012 flights have also been cancelled for Tuesday and that number is expected to rise, according to FlightAware.com. The storm expected to rapidly intensify Monday evening began as a clipper system that brought snow and slick roads to the Midwest on Sunday. The clipper system was east through the night Sunday and was expected to reach the Mid-Atlantic region by Monday morning, bringing light to moderate snow from the eastern Ohio Valley to the I-95 corridor between Washington, D.C. to New York City. As this system moves off the mid-Atlantic coast Monday evening, it will quickly gain strength and begin to move north just off the Northeast coast. The greatest impacts from this storm will be from Monday evening and through Tuesday. 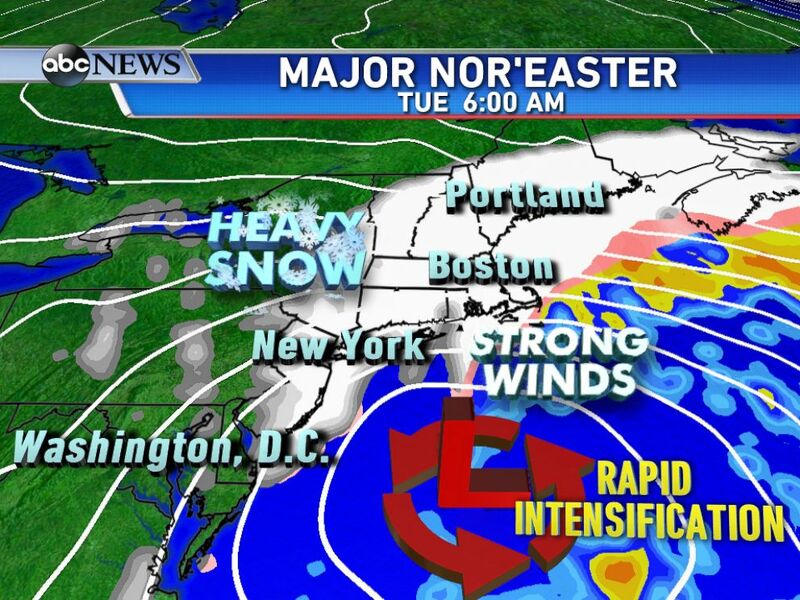 A major nor'easter is forecast to develop of the east coast late Monday and rapidly intensify by Tuesday morning bringing heavy snow and strong winds. By Tuesday morning, this storm will become a powerful weather/nor-easter.htm" id="ramplink_nor'easter_" target="_blank">nor'easter bringing heavy snow and strong winds to much of the Northeast. In New York City, Mayor Bill de Blasio warned residents not to take the storm lightly. The mayor said sanitation crews readying to try to keep the 6,000 miles of streets in the city clear, as officials prepare for what could be "one of the top two or three largest storms in the history of this city." "These are blizzard-type conditions," he said. "We expect easily two feet, even the potential of pressing on towards three feet." The Massachusetts Emergency Management Agency was also preparing for the storm, which was forecast to dump up to 2 feet of snow to some parts of the state. "All of the things that come into play during these events, we want to make sure there are no surprises and everybody is on the same page," said MEMA spokesman Peter Judge. Winter storm watches, warnings, and advisories are in effect from the mid-Atlantic to New England, with blizzard watches posted for cities closer to the coast, including New York City and Boston, where blizzard conditions are expected during the height of the storm. The latest forecast from the ABC News Weather Team is calling for over a foot of snow from New York City to Boston by Wednesday morning. The highest snowfall amounts are currently expected between just east of New York City and Boston, where as much as two feet of snow is expected. New York City can expect 12-18 inches of snow, with cities southwest on I-95, like Philadelphia seeing 6-12 inches. Lesser, but still disruptive snowfall amounts, are expected for areas farther to the west and south. Blowing and drifting snow is expected throughout Tuesday, with wind gusts over 40 mph possible along and near the coast from New Jersey up to Maine creating whiteout conditions. In anticipation of the dangerous winter weather, several major U.S. airlines have issued travel advisories, including Jet Blue, US Airways, American, Southwest, and Delta. Many airlines are also waiving their flight change and cancellation fees for any flights that are scheduled to arrive in cities expected to be affected by the storm on Monday and Tuesday. Travelers can check with their specific airline for how to change or cancel their flight and get the latest updates on any travel advisories.